The web apps for OOW14 were pretty good. The main exception being that you couldn't schedule overlapping sessions. I know it is important to reserve seats for just 1 session at the time but it would be great if you could add reserves to your schedule or have private meetings overlap. Umm the mobile app was really disappointing. It didn't show private events and if you didn't update it failed to work. very poor. Many sessions were pure marketing and disappointing. I attended one on extending Fusion Applications and they never even got a mention! But there were many,many more excellent sessions and many I wanted to attend and simply didn't have the opportunity. The Wi-Fi wasn't too bad this year - but then I was mainly in small venues were bandwidth was probably better than Moscone itself. 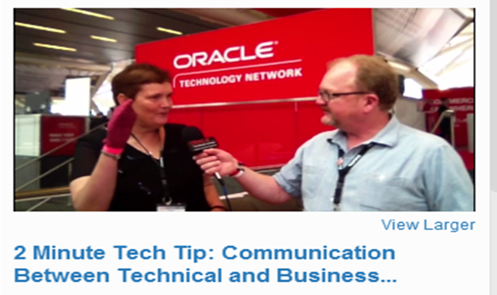 Thanks to OTN and Bob Rhubart I had the chance to make a two minute tech tip video, and since I don't do technical, I took the opportunity to talk about the importance of IT & Business speaking, something that came up in my AppAdvantage session. (You need to watch it to understand why I am wearing socks on my hands). 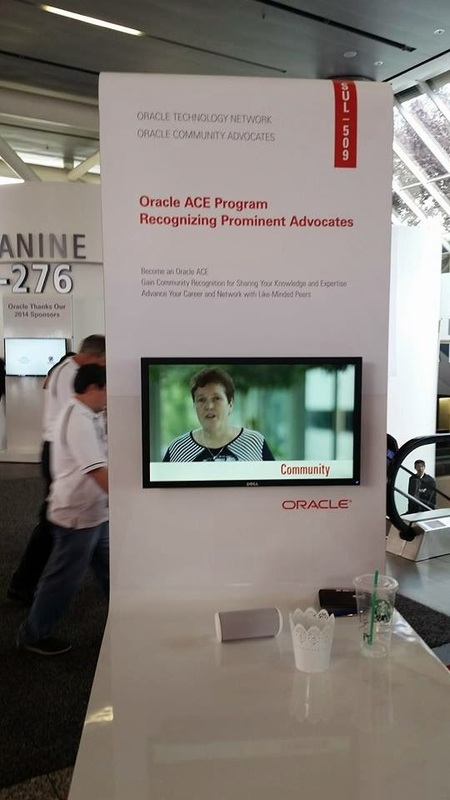 I also have a small part in the OTN video about the ACE program where Thomas Kurian talks about its importance to Oracle. I loved all the off piste entertainment - the official ones and then the Bloggers party - thanks Pythian, and especially the ACE Dinner, very different and thanks again for including my daughter. So I'm home, caught up with the Laundry, made progress with the list of things to follow up and already thinking about next year. October 25th - 29th.